The fundamental concept is that public space is not a private property. So, a facade (the outer skin, the last millimeter) belongs to the town, not to the owner of the building. Changing the rendering, a window, adding or removing anything from a facade requires a permission delivered by the town's authority. In places like Paris, Bordeaux, Marseilles, Lyon, Strasbourg… everywhere one can find a registrated building such as a cathedral, a castle, or a group of ancient buildings, a national administration is controlling this permission. This administration is called «historical monuments administration» and is locally lead by a specialized architect. In the late seventies, French government decided to reduce advertising on the roads and on the city walls. Advertising on the road was leading to a confusion reducing the efficacy of the roadsigns and direction signs, which is dangerous. The reduction was under control of a national administration: the ministry of equipment in charge of the roads design. Advertising on the walls with publicity boards was under control of the cities. Every city has a townplanning regulation. Many cities included forbidding advertisement boards on the walls in this regulation. A couple of firms, but mainly once (Decaux) found clever to give a hand to the cities to control advertising. Decaux developed a line of bus stop shelters including advertisements and advertising panels and paid the cities the right to put rather smaller publicities on the public domain. Now Decaux is no more alone on this market and the cities are comparing offers. The other fundamental laws are commercial: on one hand «low offers make high prices» and on the other hand «too many signs are insignificant». Reducing the number of signs makes the remaining signs more readable, which is the first quality of advertising. That is why every one seems to be satisfied with few publicity. The town gets more money out of it and offers a nice townscape. The publishers are sure to be alone on the market as long as they keep the contract. The publishers are sure to be alone on the market as long as they keep the contract. The firms are guaranteed to be well seen. DE RENDINGER, Patrice. Reducing Outdoor Advertising. 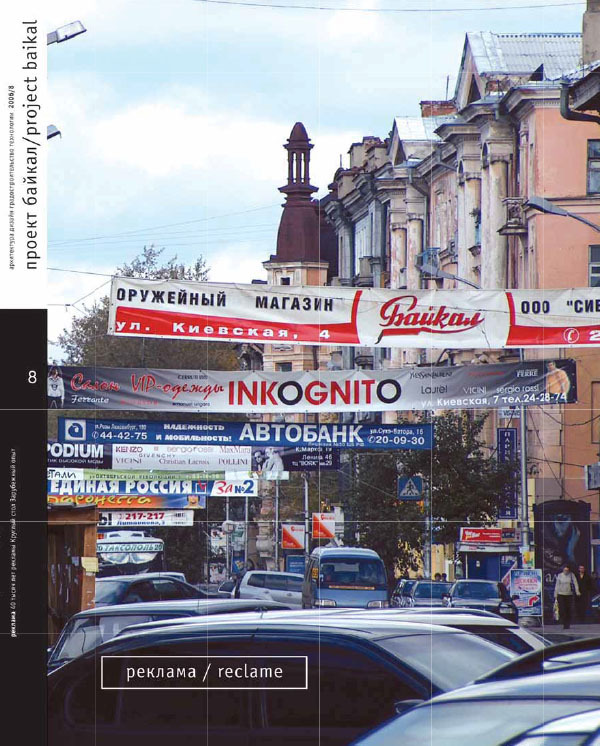 project baikal, Russian Federation, n. 8, p. 35-36, may 2006. ISSN 2309-3072. Available at: <http://projectbaikal.com/index.php/pb/article/view/487>. Date accessed: 22 apr. 2019. doi: https://doi.org/10.7480/projectbaikal.8.487.